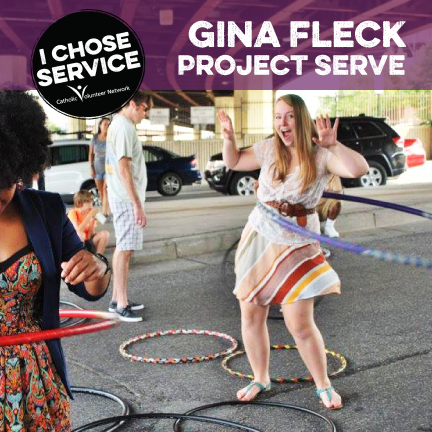 Home > I Chose Service > I Chose Service: Gina Fleck, Project S.E.R.V.E. How did you first learn about post-graduate service? It was through word of mouth! I was interning at the Maryland Catholic Conference in Annapolis and expressed my desire to do a service year in Baltimore. I thought I wanted to go to law school at the time so I could do advocacy work on the state level. I felt like I couldn’t advocate on behalf of marginalized populations or people affected by injustice if I didn’t first get to know their stories and build relationships with them, so I started looking into different post-grad service programs that offered opportunities to partake in direct service. A colleague recommended Project S.E.R.V.E.! What other options were available to you, and why did you decide on Project SERVE? I was considering going directly into law school. I took the LSAT and started a few applications and then heard about Project SERVE. I decided to do a year of post-grad service because it just felt providential. The timing could not have been better and Project SERVE fit all I was looking for: it was a year of faith-based service in Baltimore, where I had previously done several service trips through college. Ultimately, the prospect of doing a year of service filled me with an excitement and hopefulness that no other post-grad options did. I wanted to find a way to integrate my faith with my work on a daily basis, and it seemed like a great opportunity to do so! Tell us about your service experience. My service placement was at Our Daily Bread, the largest soup kitchen in Maryland. I helped to coordinate the 40 volunteers it takes to run the lunch service every day and helped with a plethora of odds and ends. I also got to tutor men in an 18-month residential employment academy for formerly homeless or incarcerated men called Christopher Place. The CP men and I may have looked like a funny match to outsiders, but we got along swimmingly! I was completely astounded by their resilience, humor, and get-it-done attitude. My year of service made evident my own privilege and how we can all learn so much from others who are different from us. I could never have imagined how much they would teach me—I just had to dive in and allow myself the chance to grow! The experience really opened up a whole new world; what I learned was equally frustrating and exhilarating! My experience living in community was fantastic—I think I would have crumbled in this environment of newness had it not been for the support and discussions with my community members and our awesome coordinator, Allison. They were great guides and friends all the way through! What benefits have you gained from this experience that you might not have received otherwise? The most wonderful gift I received from my year of service was a change of heart. A year of service afforded me the opportunity to cross over into territories and backgrounds formerly uncharted in my own life. I stretched and altered my opinions on so many issues. I was surprised and upended by the consistent generosity of people I met who were poor and in great need, but still wanted to make sure I had a good day and was doing well. I was astonished to uncover some of the gifts I didn’t know I had before the year and pleased to have a practical outlet for using them. My year of service also led me to my current job with a post-grad service program in Baltimore called Bon Secours Volunteer Ministry! It keeps me connected to my own year of service and helps me get others excited about the prospect of doing their own service year. I don’t think I would have found a job nearly as exciting or fulfilling if I passed up the chance to do Project S.E.R.V.E.